Gabrielle Kauffman specializes in wheel thrown stoneware that is food, microwave and dish-washer safe. Her bowls and mugs are in highest demand, but she also sells plates, vases and wine cups. Gabrielle is largely self taught but has taken part-time classes at Central Technical School, George Brown College and one course at the Ontario College of Art. Her studio overlooks a forested ravine on the banks of the Humber River. 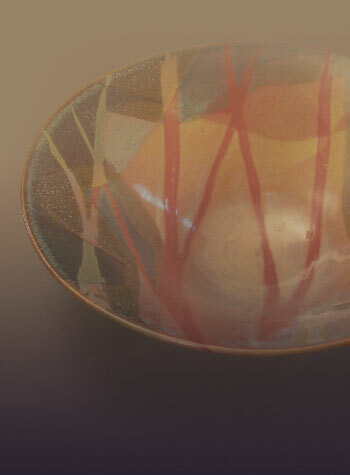 The natural forms, textures and colours inspire her work. Gabrielle experiments with overlapping glazes and wax resist to achieve richly coloured, soothing and unpredictable results. You may recognize influences from Thomson, Klimt, Matisse, O’Keefe and William Morris in her designs. Gabrielle draws from her heritage, incorporating the simple beauty and function of historical Dutch pottery. All work is microwave and dishwasher safe. 40% of all her pottery proceeds are donated to Canadian Food for Children and Souman Nafaman, French for 'Seeds of Hope'. Customized orders available with 3 weeks notice. All studio purchases are 100% refundable. Gabrielle has a studio Sale in her home/Studio located near Bloor and Royal York in Etobicoke, the last Sunday in November from 1-4pm each year. Contact Gabrielle gkstoneware@gmail.com for more info or to sign up to receive a reminder by email.